2015 could be a momentous year for nutrition or it could be a massive missed opportunity. Nutrition policymakers can make the difference. Here's what I think they need to focus on in 2015. There are a number of recommendations on which indicators and targets to fight for. All of them recommend inclusion of the 6 WHA indicators and usually the inclusion of a diet diversity indicator. Come together, policymakers, engage with those who are at the centre of the SDG politicking and convince them that without good nutrition, lives and livelihoods are built on quicksand. Don't just talk about it, fund it. The annual data bill for the MDGs (for all MDG countries) was $1 billion. Small change, but vital to drive and monitor big changes. Countries and UN agencies cannot do this on the cheap. Invest in good data if you want change. You have estimates that are summarised in the Global Nutrition Report--use them. The benefit cost ratios are credible. They are competitive with other investments. They can be vote winners, just ask the Peruvian Government. Can an investment in nutrition sensitive agriculture be good for agriculture? Yes! For example, it can help Ministries of Agriculture show they are affecting all people's lives--not just farmers. Ministries of Agriculture will need to reinvent themselves over the next 10 years, from departments that worry about farm output to departments that worry about the effect of farm output on human wellbeing. A focus on nutrition can help jumpstart this. In addition to the SDGs, there will be major Climate and Finance negotiated outcomes in 2015. For example, on climate, a focus on the first 1000 days of nutrition outcomes can help stress the damage done by the increased volatility in food prices caused by climate. For innovative finance, can a focus on nutrition stimulate new thinking about cross-sectoral funding mechanisms? If you want people to take nutrition more seriously then you need to show others that you take it seriously. This means identifying nutrition in your budgets, tracking nutrition spending, and analysing it. This also means making your national data systems more interoperable with UN data systems. And for all of us who are not nutrition policymakers? Let's support them (and occasionally nag them) in their pursuit of this kind of agenda. 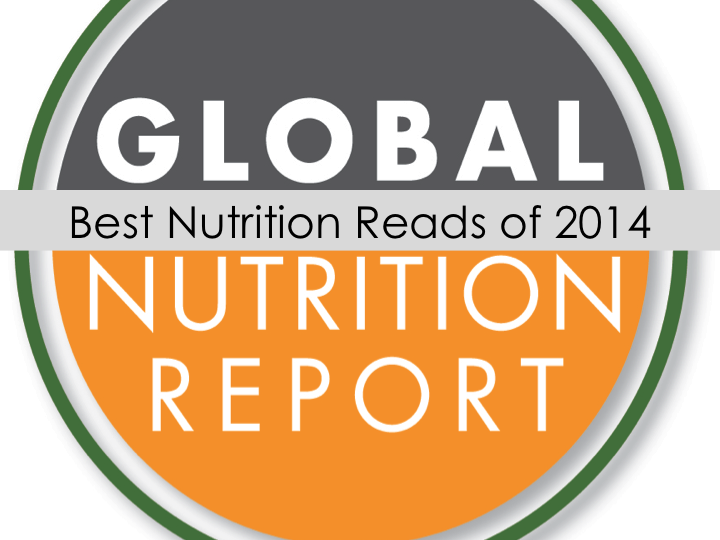 Since professional decorum does not allow me to share my "best songs of 2014" on Development Horizons, I will instead list the Best Nutrition Reads of 2014 from the Global Nutrition Report's Independent Expert Group (IEG). Some great ones are listed (many of which I missed in 2014) and they show the diversity of skills and interests within the IEG. Huffman, Sandra L., Ellen G. Piwoz, Stephen A. Vosti, and Kathryn G. Dewey. "Babies, soft drinks and snacks: a concern in low‐and middle‐income countries?." Maternal & child nutrition (2014). The authors assessed the proportion of children 6-23 months of age consuming sugar snack foods in 18 countries in Asia and Africa using data from selected international and national sources and highlighted the lack of good quantitative data on the purchase and consumption of snack foods by infant and young children and on associations between snack food consumption and stunting and overweight. The conclusions of this study are similar to those of 2014 GNR on the huge gap in food consumption data. Project: the Fetal Growth Longitudinal Study and Newborn Cross-Sectional Study." The Lancet Diabetes & Endocrinology 2, no. 10 (2014): 781-792. I heard Hans Verhagen’s presentation on “Integrating risk-benefit assessment in food and nutrition” at the Micronutrient Forum this past June 2014 and afterwards I read this paper. 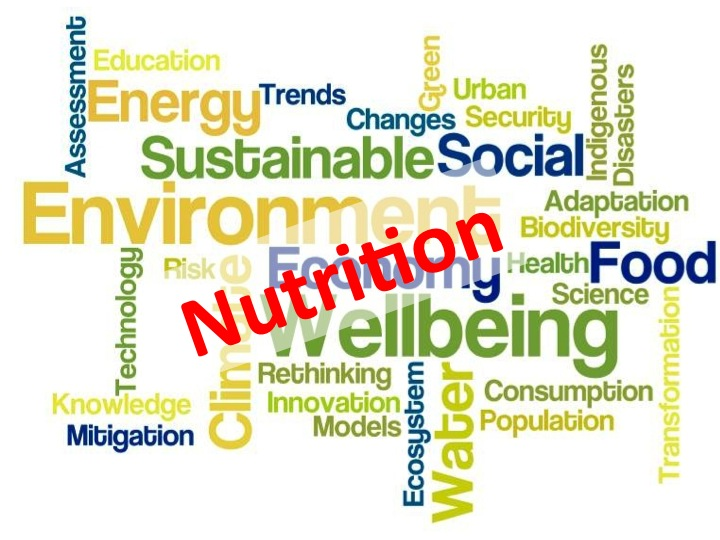 For micronutrient interventions this paper is particularly important because it presents a methodology to deal with the issues of benefits and risks in an objective way so we can better inform policy decisions. The 2014 National Geographic series on the Future of Food (digital version natgeofoodapp.com). This is special. It addresses familiar topics from unusual angles, using big graphics and beautiful pictures. Nothing to do with nutrition directly. I read this one early in the year and it stuck with me. It tries to predict if we can really get to zero poverty by 2030 (the World Bank said we could). Bluhm and colleagues show we can, but it will take a very rapid decline in inequality combined with sustained growth in most countries to do it. So it busts open a rather careless statement from the Bank, but gives us some hope that with business not as usual, we can do it. Good caution and good inspiration for the nutrition world. Norris SA, Wrottesley S, Mohamed RS, Micklesfield LK: Africa in transition: growth trends in children and implications for nutrition. Annals of nutrition & metabolism 2014, 64 Suppl 2:8-13. This paper systematically reviews literature to discuss child stunting within the context of economic growth and adult obesity, and concludes that many transitioning African countries face a complex challenge of the double burden of malnutrition and need to apply a multisectoral approach to arrest and prevent obesity as well as accelerate the reduction in stunting levels. This paper gives a really comprehensive summary of what we know and what we don’t know about mechanisms underlying child undernutrition. It opens the door to new research topics but also to new nutrition interventions to be developed. Bredenkamp, Caryn, Leander R. Buisman, and Ellen Van de Poel. "Persistent inequalities in child undernutrition: evidence from 80 countries, from 1990 to today." International journal of epidemiology (2014): dyu075. This paper reminds me that in the end undernutrition is about fundamental societal inequities and that without a social equity lens this problem is not going away. This was a very readable article about an important subject. Bollyky, Tom, Mitch Daniels, Tom Donilon, “The Emerging Global Health Crisis: Noncommunicable Diseases in Low- and Middle-Income Countries,” December 2015, Council on Foreign Relations, New York. This report will be a game-changer because it is produced by diplomats and politicians, not just technocrats. It will help create the political will to fund and implement programs and policies to reduce NCDs and their risk factors, which are now nearly universal. The new book by the Right to Food and Nutrition Watch: http://www.rtfn-watch.org/. It is oriented towards policies and politics, and focuses on underlying drivers of food and nutrition insecurity. It also provides good policy examples that are promising to contribute to better food and nutrition security. Especially the paper about Zanzibar. The project behind this paper showcased the importance of a nutrition research agenda that speaks to the 'demand' of countries in SSA, with active participation of the African stakeholders, and called for other stakeholders to align with it. This is really inspiring, showing capacity, leadership, and a good practice model. The Standing Committee on Nutrition just released a useful new paper with recommendations for nutrition indicators to be embedded into the SDGs. I really like these 10 indicators. They include the 8 I had suggested in my blog earlier this week, plus minimum diet diversity for infants and young children and government spending on nutrition. The indicators meet scientific credibility standards (do they measure what we think is most important? ), have political legitimacy (e.g. the WHA indicators) and are measurable (although we currently do not have many data points for government spending, as the Global Nutrition Report notes, we could). 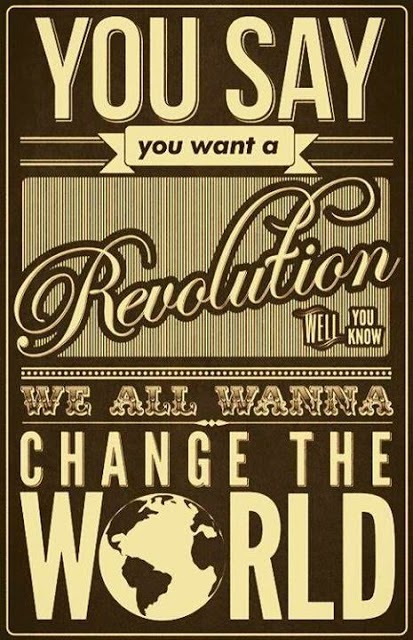 The quicker we reach a consensus the quicker we can organise and influence as one community with one voice. As the SDG deadline day in September 2015 fast approaches, a consensus position needs to emerge on how to position in nutrition in the SDGs. Without such a consensus lobbying activities will be unfocused. Here is one proposal to react to. Diversity: 8 nutrition indicators are in 3 Goals; 10 nutrition relevant indicators are in 7 Goals. Overall, 8 of 17 Goals are involved. I don't know how we reach consensus, but more people need to be talking about how to position nutrition in the SDGs. After 2015 the SDGs will be the main game in the development town. Climate Change and Nutrition: What do we do differently? 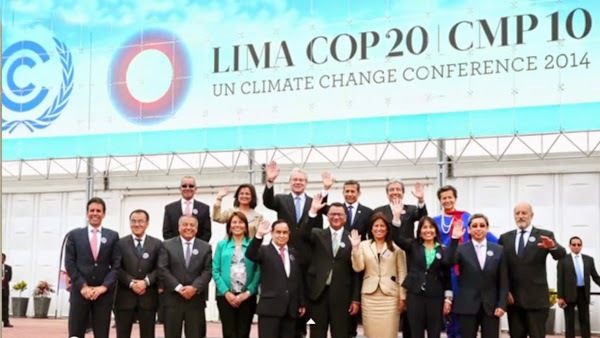 It is good news that an agreement has been sketched out in Peru at the COP20 climate talks for a roadmap to longer lasting deal in Paris at the end of 2015. Despite the criticisms from some groups that it is watered down, at least it keeps hope alive that something effective and realistic can be finalised in a years time. But what does this mean for the way nutrition programmes and initiatives are designed and planned? We think that climate change affects food production in a way that is not good for nutrition. We also think that climate change increases the incidence of diarrheal diseases and other infectious diseases that negatively impact on nutrition. This set of slides from the London School of Hygiene and Tropical Medicine provides a good primer and summary of key studies. Clearly, our nutrition strategies are going to have to adapt, but how? On the adaptation side the changes that nutrition strategies will have to make will vary country by country and region by region, but the need to adapt means an ever greater emphasis on the need to link food and nutrition data with climate data such as temperature and rainfall data at the subnational level. The problem is, we don't have much subnational nutrition data. I wonder if there is a benefit to modelling nutrition outcomes much as we modelled poverty rates by combining surveys and censuses in the poverty mapping domain? Climate change also places a greater value on the diversity of the location of production and on the diversity of crops and products within production systems. Diversity is one way of spreading the risks that a changing and uncertain climate brings. Diversity of production should also have a positive impact on diet diversity where food markets are weak. Social protection programmes should play an even bigger role in a context of more shocks and uncertainty as they help families smooth consumption without having to take kids out of school or forgoing health care. WASH programmes will have to become more alert to changes in water tables and drainage systems. The emphasis on prevention will be stronger and this strengthens the case for things like exclusive breastfeeding and fortification/supplementation with iodine, iron, folic acid, zinc and vitamin A. On the mitigation side, we don't really know what the emissions consequences are of different nutrition strategies. A first step in this regard is to measure the resource use and emission consequences of different strategies. 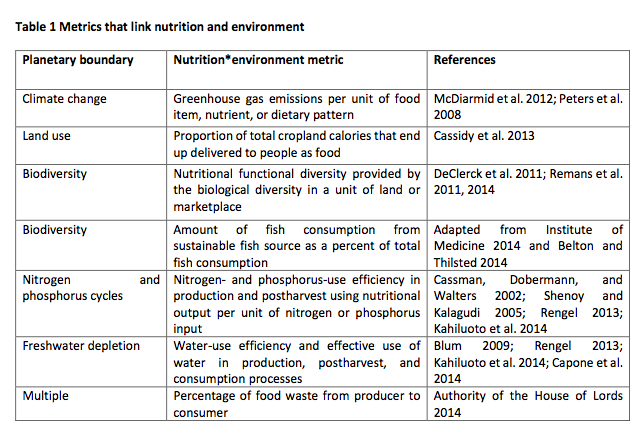 Technical Note 4 from the Global Nutrition Report was produced by the Standing Committee on Nutrition (SCN) and I think it represents a good summary of where we are and provides some good ideas of where we need to go and how to get there (see Table from the note, below). The climate debate may seem a world away from the nutrition community, but the world where climate and nutrition interact is already here. Just like everyone else, we need to be prepared. There are many people, me included, who are calling for a data revolution nutrition. This means considering data as an essential rather than a luxury item, not tolerating data gaps when they are a block to effective action and not making do with old data. But the assumptions behind this are that (a) data are not prohibitively expensive to collect and (b) they actually have returns that are several multiples of the cost. So I really welcome a new paper by Morten Jerven, under the Copenhagen Consensus banner, which asks the general question: is a data revolution for the SDGs a good investment? His answer is a resounding no. However I think there are some fundamental problems with his analysis. How does he come to this conclusion? He proposes, for every country, a population census every 10 years, a demographic and health survey every 5 years, a living standards measurement survey every 5 years and an annual Core welfare Indicator Questionnaire. He applies this to the 25 year MDG period, 1990-2015. He gets cost estimates for each, based on published data. He applies this to 138 countries for the 8 MDGs (18 targets and 60 indicators). The grand total is $27 billion, which works out to just over $1 billion per year over the 1990-2015 period. He suggests this is an underestimate because data collection capacity costs are not included. He then notes that the 17 SDGs have 169 targets (we don’t know how many indicators) and therefore the SDGs will cost (169/18) x $27 billion or $256 billion. He then compares this to official development assistance (ODA) and says it is nearly twice a large. He also says it is really hard to get a sense of the returns to improved data and says the benefit-cost ratio is likely to be less than one. First, it is highly unlikely that the SDGs will have nearly 10 times as many targets and indicators as the MDGs. That would be nearly 600 SDG indicators. Simply not going to happen. My guess would be fewer than 100 targets and less than 200 indicators, but it may well be a lot less than that. So let’s increase the $27 billion by a factor of 5. To about $100 bn. Second, $100 bn is still a lot of money. But this has to be divided by 15 years. Per year this is about $7 billion. Increase this to $10 billion, because the number of countries is increasing from 138 MDG countries to 193 SDG countries (i.e. all of them). Third, so $10 billion per year. This is a lot of money but less than 10% of ODA. But the comparison with ODA is spurious, because most of the costs will be covered from domestic resources for all but the poorest countries. I would imagine only about one fifth of the cost of indicator collection will come from ODA. If so, that is $2bn a year, which is just under 2% of ODA. Still a lot, but that is the lower bound ratio most organisations factor into their project costs for M&E. The better arguments for caution, I think, lie on the benefits side. Jerven rightly points out that data that guides action is most valuable. He makes the argument that the most valuable of this type of data is collected frequently at a rather granular level and that most of the SDG indicators will not be like this, therefore they will be less valuable. I’m less pessimistic. First, we can try to get more of these intermediate indicators into the SDGs—things like spending, coverage and staffing. Second, the impact indicators on nutrition status, say, are useful for civil society to put pressure on governments to act, and for governments to calibrate their actions. These data are also essential for research and analysis to guide action. So my conclusion is that this is a very partial paper. Data collection costs are certainly not prohibitive. And the benefits can be maximized by asking when is the absence of data a barrier to action that we know is effective. The data revolution is just that—a call for better data, but also a different way of thinking about data in terms of costs and benefits and also in terms of effective actions supported and bad actions suspended due to better data. Don’t kill off the data revolution before it has even had a chance to turn things around. Groucho Marx once said "Practically everybody in New York has half a mind to write a book, and does." 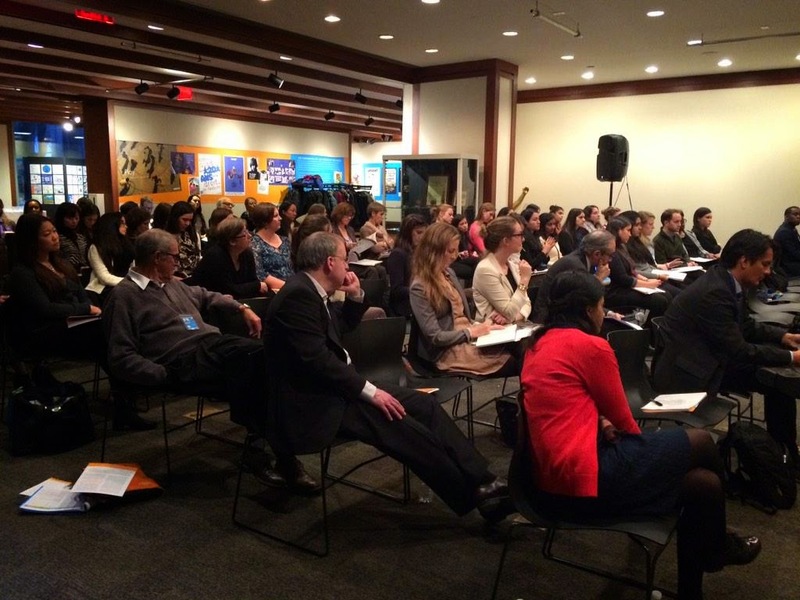 Last night, at UNICEF HQ, we discussed the whole of the Global Nutrition Report. It was organized by UNICEF, Columbia University and IFPRI. It was a great line up. Here are some of my takeaways from their presentations. * how can we scale up financing for nutrition? why not think about a SUN Fund? Donors pooling more funds for lower transactions costs and greater coordination. Can we learn from Global Fund and from GAFS? Leith Greenslade, UN Special Envoy for Financing the Health Millennium development Goals. * the report is clearly written, now what do we do with it? 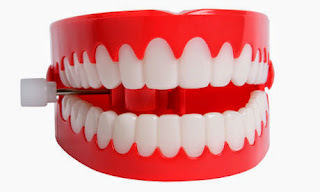 * need to grow the "nutrition community"
* SUN Fund or Global Finance Facility or no pooled fund? Big thanks to Jessica Fanzo who shaped the meeting and pulled it together! Do We Really Need a Nutrition Data Revolution? Um, Yes. 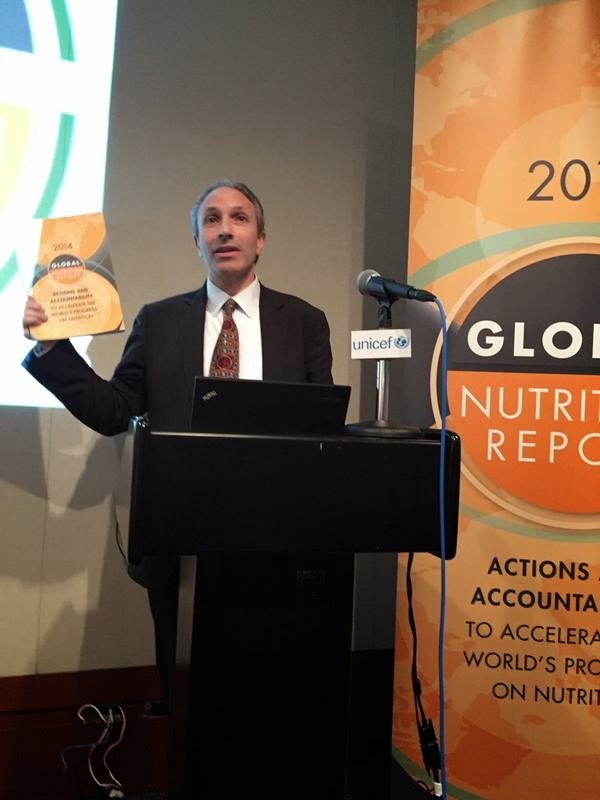 The just released Global Nutrition Report makes the case for a “Nutrition Data Revolution”. 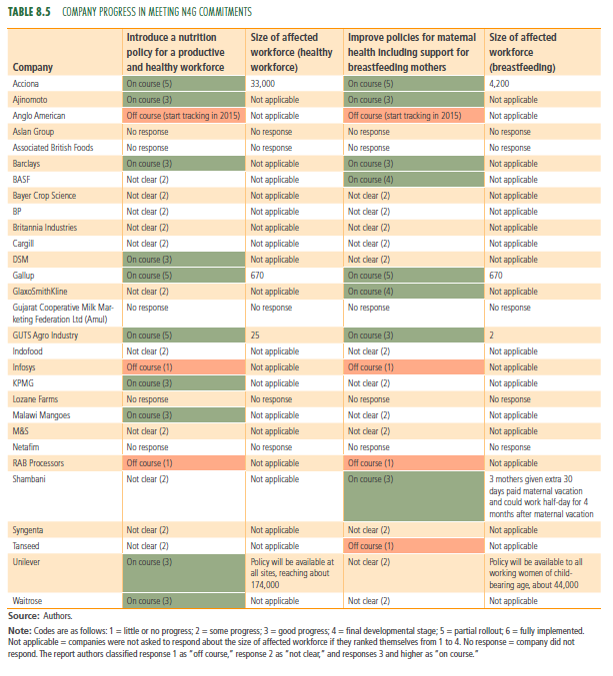 49% of 193 countries lack the data to be able to track if they are on or off course for even 4 of 6 World Health Assembly (WHA) indicator targets. And these targets were set nearly 3 years ago. 40% of the most recent child growth surveys (anthropometry) are over 5 years old. Economic policymakers could not run their economies on data that were over 5 years old—why would nutrition policymakers think they could? For the WHA indicator that shows least progress--anaemia in women of reproductive age—we have the weakest data. How can we reduce anemia if we do not have a good sense of who is most affected and when and where progress is greatest. There is no Global Database on Food Consumption. For hunger data we rely on food supply data, heroically adjusted by FAO, but still with severe limitations. We cannot even measure individual trends in the most immediate manifestation of malnutrition: hunger. Data on nutrition intervention coverage is very sparse. For example, only 37 countries have data on all five of the nutrition interventions and practices with the most extensive coverage data. We know that increased coverage will reduce stunting and yet little attention is paid to monitoring that coverage. We know how important the first 1000 days post conception is for nutrition status throughout the lifecourse and yet data on weight at birth is so poor, the Global Nutrition Report could not even report trends in low birth weight. What to do? Invest in data collection and in building the demand for data collection. And while they interact, the first is easier than the second. Globally the data priorities are reflected in the points above: food consumption, anaemia, low birth weight, and nutrition programme coverage. Nationally, the priorities will need to be set by national stakeholders. How can we convince funders to invest in data? A 2012 independent evaluation of the ESRC’s UK Data Service estimated that the return on investment to the research community alone range from 2.5: 1 to 10:1. If we believe that research has wider benefits then the return on investment to wider society will be very large indeed. How to stimulate the demand for data? We must promote accountability. The more accountable public officials are for programme coverage, spending money wisely, and reducing malnutrition the more they will demand data and evidence. Accountability can be strengthened by civil society working with the media, researchers and champions within public agencies to identify, track, assess and publicise commitments made (or not made). So more data needs to be demanded and supplied, but do we really need a revolution? Absolutely. We need a marked change in our attitude to data. The data systems we have designed are stuck in the 20th century and don’t respond to the information demands of the mobile technology age nor take advantage of its possibilities. Information is power and power shapes information. Until nutrition data collection and availability are revolutionised, nutrition data cannot be democratised. And without democratisation of nutrition data it remains too easy to ignore malnutrition--unless you happen to be one of the 2-3 billion people suffering from it. 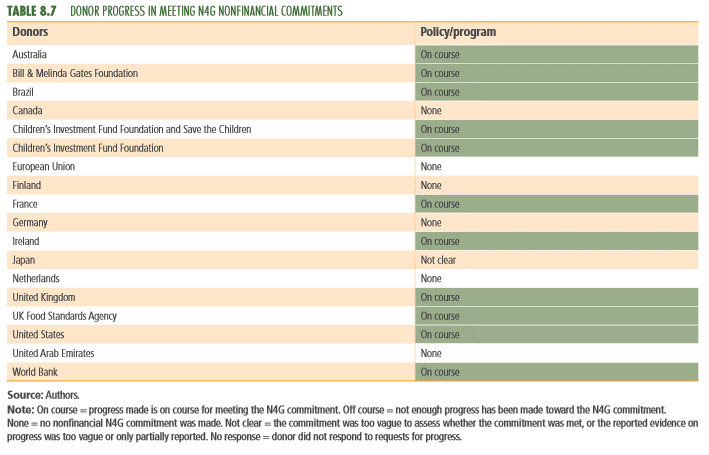 Who's On Course to Meet their N4G Commitments? And Who is Not? The 2014 Global Nutrition Report sticks it's neck out and makes assessments of whether the 100 or so Nutrition for Growth 2013 signatories are meeting their publicly stated commitments to nutrition (financial and non financial). The Tables from the report are pasted in below. You can find them in Chapter 8 of the Report. If you want to see the actual commitments made and the progress reported against the commitments, see the detailed tracking tables here. You may use them to disagree with the assessment we made. The good news is that of the 168 commitments made by the 100 or so organisations, 43% are on course with only 9% off course. The less good news is that in 37% of the cases it was not possible to determine if the responses were on or off course either because the commitments were vague or the responses were (or both). Only 11% of the commitments were not reported on. The assessments were made independently by 2 of the writing team, and then reviewed jointly, and then reviewed jointly again. * some organisations had made heroic commitments and fallen just short which others had made weak commitments and exceeded them. The former got an off course while the latter an on course. This does not feel satisfactory. * a substantial minority of commitments were made by someone in the organisation who is not longer in that role and with the subsequent institutional knowledge about the commitment being vague and unclear. * given the small numbers of organisations in each group, the on course/off course proportions are broadly similar across groups. We are going to try to make the whole process more streamlined and automated next time around. We also figure that the organisations will understand the stakes a little better for 2015 which will lead to some of them requiring a little less nagging! One of the best things about the Global Nutrition Report are the Panels. There are 24 of them in all, giving insights on a wide range of subjects from over 50 authors. The Report contains the shorter versions, but here are the longer versions (screen grab below of some of them). You can download them here as one file or you can pick and choose the ones you want to download. Please read them (they are 2 pages each) and share them. I have described the Global Nutrition Report as an evidence based Treasure Trove for influencing. 1. Malnutrition affects nearly every country: 120 out of 122 countries with data cross a nutrition “redline” in one of the following areas: under 5 stunting, anaemia in women of reproductive age, and adult overweight. Only China and South Korea do not cross any of these 3 redlines, but China is very close to the anaemia cut-off of 20%. 2. Multiple burdens are becoming the new normal: 45% of all countries with data have undernutrition and overweight problems. 3. Many countries are on track for some of the global targets: 69 out of 100 countries are on track for one or more of the WHA global targets. 31 are not on track for any. Colombia is the only country that is on track for all 4 of the targets we can currently assess. 4. Anaemia is a widespread problem on which little progress is being made, (although the data are modelled): Only 5 out of 185 countries are on track for anaemia reduction in women of reproductive age. 5. Nutrition is only mentioned in one of 169 SDG targets. Only 2 of the 6 WHA indicators are mentioned in the SDGs. 6. Investments in nutrition outperform the stock market. For every dollar invested in nutrition specific scale up to 90%, 16 dollars are returned over the life course. 16 is the median value for 40 country estimates—the estimates range from 4 to 56. Getting a 16:1 return over 30 years is equivalent to a 10% compound rate of interest. Over 1930-2010 the Dow Jones Industrial Index gave a 9% compound rate of interest. 7. Will India be the new China? The state of Maharashtra’s rate of stunting decline between 2005 and 2012 (7% Annual Average Rate of Reduction) has been bettered only by China’s 8% sustained over a longer period. If Maharashtra were a country it would have the world’s 12th largest population (114m), just behind Mexico and ahead of the Philippines and Ethiopia. 8. We need a data revolution in nutrition: 49% of all 193 UN member countries do not have the right data to be able to track their progress against 4 WHA global targets. The latest under 5 anthropometric survey for 40% of countries is 5 or more years old. 9. 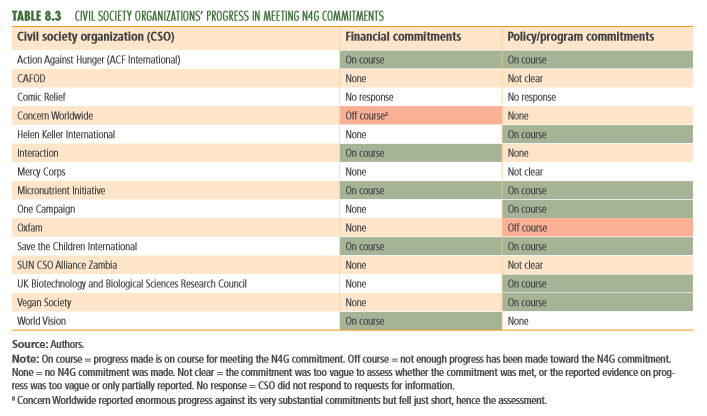 Nutrition for Growth (N4G) commitments are on track, but need sharpening. 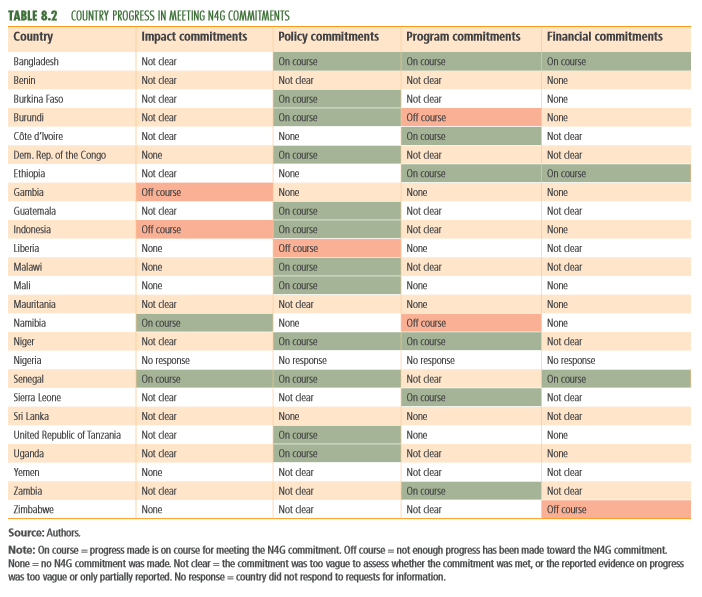 Of the 168 N4G commitments, 43% are on course, 9% are off course, in 37% of cases it is not clear whether commitments are on or off course, and 11% of commitments were not reported on. 10. Government nutrition budget data are sorely lacking, making this basic component of accountability very weak: only 3 countries can share budget allocation data on nutrition spending. 11. Donor spending on nutrition is increasing, but is still a small share of ODA. Major donor disbursements on nutrition specific and nutrition sensitive programmes have increased by 30% and 19% respectively between 2010 and 2012. Total donor disbursements in these 2 categories are just over 1% of official development assistance (ODA) in 2012. 12. The scope for an expansion of nutrition sensitive programmes is enormous: for example, in Africa, a combined total of 35% of government budgets are allocated to health, education, agriculture and social protection. 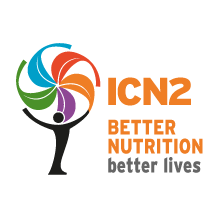 Well, the final week's build up for the Second International Conference on Nutrition (ICN2) has begun. Panelists are being briefed, speeches polished, press releases honed, op-eds hawked, social media plans finalised. But ICN2 is about much more than these rituals, important as they are. ICN2 is an opportunity for real leadership. The kind of leadership that is permanent, not just for this week until the next podium comes along. The kind that challenges conventional wisdom rather than bowing to it. The kind that is far reaching and wide ranging, not focussed on short term parochial gains. The kind that inspires as well as informs. 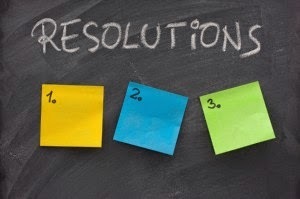 Most importantly it is a chance for leaders to demonstrate their accountability. How clear will their commitments be? How supportive will they be of efforts to track those commitments? And will they be spurred on by assessments of their progress against commitments or will they stick their heads in the sand? We need our nutrition leaders to be accountability leaders. 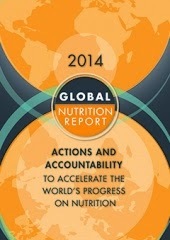 The Global Nutrition Report is one contribution to strengthening accountability in the nutrition system. The Report will be made available on Thursday November 13, at 1400 UK time, on the website. 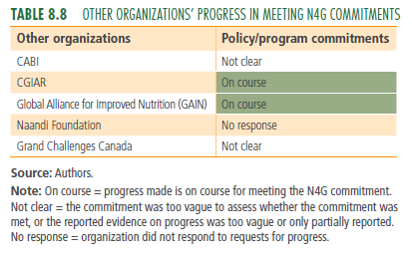 Argues that multiple burdens of undernutrition and overweight/obesity are the "new normal"
Evaluates progress on the N4G commitments--who is on course and who is not? They will be advertised in each location--please watch out for them and we look forward to your participation.